NOTE: This is a post regarding the reasons that we won't be offering a kit OR plans on a DIY washer. I'm afraid there has been a miscommunication. We will NOT be offering a kit or plans. Being preppers, as a whole, we are a group of do-it-yourselfer's. That is part and parcel with the self-reliance game - not being dependent on someone else. After exploring the idea of making his own version of the James Washer, Sir Knight was inundated with requests to sell a kit so that folks could save on shipping and build their own washer to his specifications. At first, he thought this was an idea worth looking into. He began by researching barrels, the main component for his washing machine. When he first started thinking about an alternative to the James Washer, Sir Knight figured he would pick up used barrels from one of our local suppliers (he is always thinking of way to keep the costs low). When he began to research barrels (in three different sizes), he learned that not all barrels are created equally. They have different thicknesses, have different configurations, bung placement etc. The more he looked at barrels, the more he realized that he would have to use a standardized barrel in order to make his design work. He ended up finding a barrel he liked (new) that was reasonably priced and built like a brick out-house. It comes in black (I told him that blue barrels were kind of like blue tarps - they had redneck written all over them!) and is configured to accommodate Sir Knights design. Ultimately, the problem with offering a kit is that every person will have a slightly different barrel. Some will have a flat bottom, some will be rounded. Some will be taller and narrower and some will be shorter and rounder. That being said, a universal parts kit won't fit. There is no way to account for all of the differences in barrel manufacturing. Sir Knight would rather lower his price and offer a complete washer than sell kits that wouldn't work. Interestingly, we have found that shipping may not be as expensive as you may think. We believe that a complete washer will be in the $30 to $40 dollar range to ship (more, of course, for the larger models). I just wanted to let you know that we did hear you and take your ideas into consideration. If there was a better way, we would be more than open to the suggestion. Here are some other uses for those 55 gallon barrels you have laying around! I will buy a kit when you have one. And I work for a major company who makes washing machines! well, thank goodness there are only two old fogeys living under this roof...the two washtubs, wringer and plunger will do...i am seeing alot of the old wringer washing machines cropping up at flea markets and antique/junk stores lately...many sell for their parts and many still actually work..could always use the tub as a cooler with ice :) i am sensing that more people are getting into prepping, but even these folks dont seriously think it will get really bad...i think we are all about to find out how bad things can get and i intend to be ready. I too would be interested in buying one when you have it. A few other preppers I know would be interested as well. I will have to pass this article along to them. Love the pic. 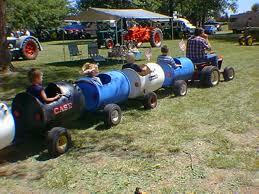 All aboard the barrel train! I also have a James Washer. I like how it works, but I recognize the problem with the agitator handle too. I also don't like my wringer, it's just like yours. Any clue as to a better one? I would be interested in what you husband comes up with, please keep us posted. In thinking over the barrel idea you proposed, I was wondering if those dark green spinning compost barrels would work? You know, the ones that have the barrel laid on its side you fill it with compost, spin it every so often and supposedly can have true to form compost in a short period. I am also thinking if you would have something like a large hand cranked salad spinner, again using barrels, you could spin your laundry out rather than crank it. I would be curious to hear your husband's opinions on this. I'd be totally willing to buy plans from you, I've looked for years on the Internet trying to find some kind of tutorial. Seriously, I can't tell you how cool that would be, please consider it! I'm really hoping you decide to sell the plans ($10 maybe? ), I've been looking for plans to make a James washer for years! I am in on the plans as well! I would dearly love to be able to build my own washer. I respect your family wisdom. You would likely wind up with hundreds of email questions for those trying to make the plans work with the wrong barrels. 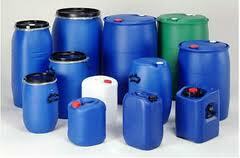 Are metal 55 gallon barrels any more standardized? Enola, is Sir Knight willing to share where locally he finds barrels (that don't cost an arm and a leg)? I live in the same area as you, and would like blue (or any color) barrels for water storage, but only find brand new for a price I can't afford, plus shipping (since they are all on the internet). I suppose I don't look in the right place, since I have no idea where the right place to find used food-grade (water-grade, actually) barrels is. The best place that we know of to look for used barrels that are food grade and reasonably priced is Eagle Peak. They are located in Athol and generally have a very good supply of barrels and buckets. They even have food grade liners for 55 gallon barrels! Hope that helps. Sorry I haven't responded earlier, been off this site for awhile (unfortunately) and just today spent the time getting caught up on a month's worth of your wonderful posts. Thank you for the location of where to find the used blue barrels. I will check into this! Also, has there been any more progress (decision?) on whether Sir Knight is going to make his version of the James washer? In the past month I found a wonderful (looks almost new! that wonderful!) 1940's-era washing machine (the kind that runs on an electric motor mounted underneath the tub, which also runs the wringer mounted on the top of the tub. What I have been wanting for ages! And it was meant for me to have it, I'm sure. I never go onto Craig's List, but had read something about it, and decided to actually go and look. The washer had just been posted a few minutes earlier. But it wasn't local (actually about 1-2 hrs away, which for me in the winter might as well be on the moon!). I dithered around for about 2 hrs thinking about it (I hate telephones, and won't make a call to save my life if I can help it), then finally talked myself into calling the phone number listed (knowing, of course, that the washer had already been sold--I mean, it had been 2 hrs since it was posted!). The owner answered right away; no, he hadn't sold it; I asked if he was willing to deliver it, and he actually said yes!!! Unbelievable! So the next day, he delivered it right to my parent's doorstep (I am their caregiver), and set it up and worked it for me. Everything seems perfect on it. When I haul it home to my own place, I will have an electric washer that won't take much water, with a motor that can easily be replaced with either a gas motor if need be, or even something like a bicycle to work with just muscle power.